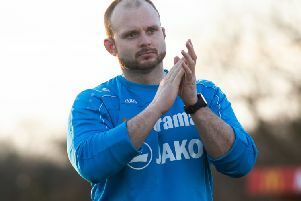 King Langley’s 0-0 draw at Redditch on Saturday was the same scoreline as the previous match, but whereas last weekend’s draw at second-placed Leamington felt like a victory, this felt like a defeat. Redditch, a side whose lack of wins in 2017 exceeds that of Kings, looked beatable and they were deemed safe from the drop only after this result. The disappointment was compounded by the fact that the other four teams contesting relegation all won on Friday or Saturday. Both teams opened in attacking mode on the unpredictable artificial pitch. Dior Angus had successive shots saved by Kings’ keeper Xavi Comas while Matt Bateman had a looping header just over at the other end. Langley’s Lee Stobbs was combining well with Bateman, providing chances for Lewis Toomey and Plowright, while both went close themselves, but United finished the half the stronger with several chances including a goalbound effort cleared off the line. Bateman opened the second-half with a low shot saved and the game was more open. Redditch responded with a purple patch that saw Kings defending desperately, but the visitors rode that out and mid-half Bateman eluded the defence to find only the United keeper to beat but his shot was uncharacteristically scuffed and saved. Comas pulled-off a perfect sliding tackle almost on the touchline to keep Kings in it and the game was on the verge of normal time ending when an inswinging cross was headed home by Bateman, only for it to be ruled out by the linesman as the cross was deemed to have briefly gone out of play. n For a report of Langley’s huge 2-0 bounceback win at Hayes & Yeading, see lead story above.